Abi is living her happy ending. She's in remission and is ready to make the most of her second chance at life. But during Abi's illness her family has fallen apart. Her husband John has made decisions that are about to come back to haunt him, while her teenage son Seb is battling with a secret of his own. Set to the songs on Abi's survival playlist, this is the story of what happens next as Abi tries to rebuild her family. Can she bring the people she loves most in the world back together again... before it's too late? 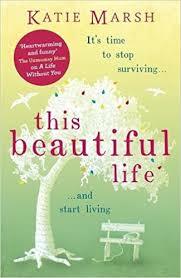 This Beautiful Life is the first book I have read by Katie Marsh and having now finished this powerful and emotive read I know it on't be my last as this book is sure to leave a lasting impression on me. The storyline introduces us to a family who have been through a desperate time with mum Abi fighting cancer and now she is in remission it shows the effects that the fight has had on the whole family and how as a sufferer it completely changes your outlook on life in the immediate aftermath. We also hear from her son Seb and how he has coped but he is hiding his own challenges which he is determined to hide from his parents. Husband John who was a rock all the way through now sees his marriage falling apart and he can't put it right. This was such a raw emotional read that will touch each and every reader it was so honest and realistic and was delivered with such sensitivity and detail. I have read a number of books now with cancer patients as our main characters but this storyline was unlike any I had read not being afraid to show that Abi still has her flaws and makes mistakes just like anyone else. Seb is also hiding something he is trying to come to terms with which again was very insightful and dealt with so tenderly. I love how we hear from both Abi and Seb's points of views which gives even more depth to their characters and makes their stories even more poignant hearing from both of their thoughts. Another wonderful touch was the playlist that compliments this book, at the beginning of each chapter we are treated to another new song which Abi dedicates to her loved ones. The ending is one of those that has you shouting at the pages " YOU CAN'T FINISH THERE" but in hindsight having now taken a day or two to complete this review it is actually a perfect realistic ending to an honest plot. This was an insightful and heartfelt read that will stay on my mind for a long time to come. This author has really touched my heart with her beautiful writing style I can not wait to delve into another of her novels even if it is to have my heart broken all over again! 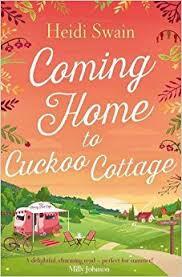 Coming Home to Cuckoo Cottage is the latest release by Heidi Swain and sees us returning to the idyllic village of Wynbridge with the introduction of a new main character the lovely Lottie Foster. When Lottie’s grandmothers best friend passed away she left Lottie her home, Cuckoo Cottage, hoping that this would give Lottie the chance to make a real life for herself. As Lottie begins to put down her roots and starts playing with ideas on how to utilise the land which comes with her new home it soon becomes clear not everyone wants to see her settle at Cuckoo Cottage. I have read all of Heidi’s books and I love that so many of the previous characters are all weaved into this storyline and that we re-visit Skylark Farm and the delightful Cherry Tree Cafe. This book can easily be read as a stand alone but having read the previous books this one just felt like reuniting with friends. You can expect witty moments from early on in this book and a typical love triangle between Lottie her helpful builder Matt and delightful neighbour, it was a little predictable but never the less a joy to read as we watch events unfold and testosterone flow! The community spirit comes across strongly in this book, no one can keep a secret as everyone knows everyone business and yet they all rally round and help each other. I don't want to give away any spoilers so I am not going to say too much but I rather hoped we would see the development of Lottie’s idea come to light as Heidi has great descriptive writing and I was eager to watch Lottie develop her vision. I thought this was a wonderful light read and fans of Heidi Swains previous books will not be disappointed as her character and charm from her previous books are all found in this new release. 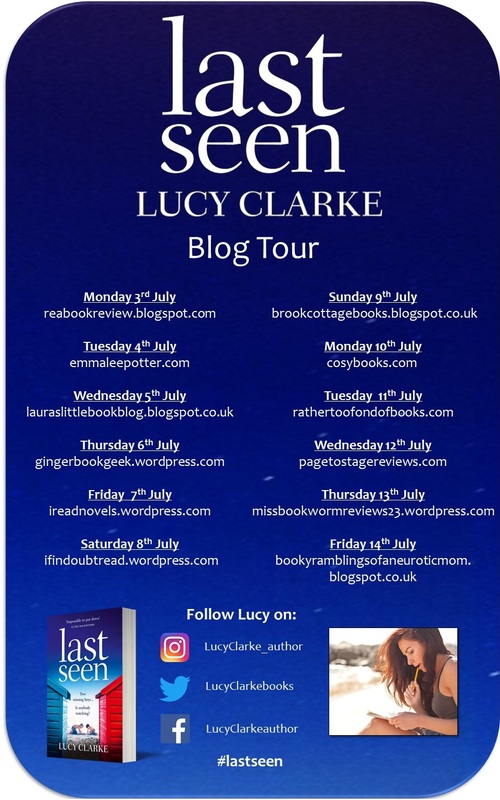 I am kicking off the blog tour for this fabulous read by a much loved author of mine Lucy Clarke. I have been desperate to share my review for Last Seen for weeks so I am thrilled that I can finally now shout about it from the roof tops! The Queen of the sea is back with her new novel Last Seen which is just as gripping and twisty as her previous books but has a slightly darker feel to the storyline. Seven years ago two little boys Jacob and Marley swam out to sea but only one is brought back, the events of that day has had a big impact on the friendship between the boys mothers Sarah and Isla. On the 7th anniversary of the accident, Jacob disappears and Sarah is desperate to find her son but trying to find him will mean many secrets will need to be revealed. I was captivated the whole way through this book. The characters were all so well developed but strangely for me I didn't warm to any of them because this storyline has you questioning each and every character and their motives so because you are too suspicious of everyone you don't allow yourself to trust and warm to any of them. Usually if there is not a character I love it really puts me off a book but I didn't feel this way with this novel and I think that is because the plot was so strong with so much uncertainty and mystery that I was desperate to get to the bottom of the events all those years ago as well as the present day. I can honestly say at no point could I have predicted what was revealed in this twisty book, I had my suspicions that a certain character definitely had a lot to hide but then I suspected everyone! If you love an unpredictable storyline that constantly leads you down the wrong path then you will love this book. What I have always loved about Lucy Clarke's writing is her connection and descriptive writing she has when writing about the sea, this woman must have been a mermaid in a previous life! This book again is set around the sea with a tragic accident occurring in the waters and the author brings out the mystery of the sea which holds many secrets never to be told. At different points in the book I found I was shocked, disturbed, angry, suspicious and I also questioned how far I would go to protect a love one so this book will take you on a real journey of emotions. This is another must read by Lucy Clarke so be sure to grab a copy next time your in town.